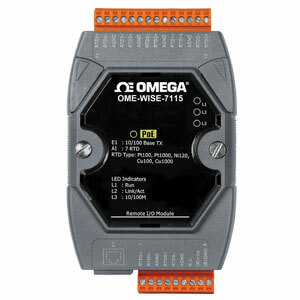 OME-WISE-7000 Series (Web Inside, Smart Engine) is a product series that functions as control units for use in remote logic control and monitoring in various industrial applications. OME-WISE-7000 Series offers a user-friendly and intuitive web site interface that allows users to implement IF-THEN-ELSE control logic on controllers just a few clicks away; no programming is required. With its powerful and easy-to-use features, it will minimize the learning curve, shorten time to market and dramatically reduce the labor and cost spent on system development. Through a Web browser, users can access the Web Server on OME-WISE-7000 Series controllers to perform tasks such as logic rule edition and download. A Rule Engine will be set up to manage and deploy logic rules for controllers. The Rule Engine will check whether the rules are valid or not and determine the execution of actions under specific conditions, for examples: setting up I/O channel values, perform timer tasks, sending Email message or sending CGI command under a specific condition. With the Advanced P2P function, all OME-WISE-7000 Series controllers in network can freely share their status such as AIO value, DIO value, DIO Counter value or Internal Register value to each others. This function greatly enhances the flexibility and boosts accuracy to the logic rule design and makes it easy to enable the interactions between the controllers. In addition, through MODBUS/TCP Protocol, a SCADA package enables control and monitoring of I/O channels or system status on OME-WISE-7000 Series controller in real time. OME-WISE-7000 Series controllers are equipped with an IF-THEN-ELSE logic Rule Engine, it offers up to 36 IF-THEN-ELSE rules for users to set up the logic content. After completing rule edition and downloading rules to the OME-WISE-7000 controller, the Rule Engine will loop execute the rules in accordance with the execute order under specific conditions. No Extra Software Tool is Required OME-WISE-7000 Series HMI interface runs on regular Web browsers. To edit control logic, it only requires a browser to connect to the Web server on OME-WISE-7000 controller. No extra software tool installation is needed on the target PC. OME-WISE-7000 provides user-friendly Web UI pages for editing control logic on the controllers. It enables to implement logic edition by a few clicks on the mouse to set up and deploy logic rules without writing a single line of code. In addition to 3 THEN Actions and 3 ELSE Actions settings OME-WISE-7000 Series provides for each Rule, Recipe function is provided for easily grouping a series of Actions. A series of actions can be stored and saved in a Recipe action and will be executed when the IF-THEN-ELSE condition is matched. Timer Operation OME-WISE-7000 Series features a timer function: It allows the user to perform specific tasks such as time delay. Remote Monitoring and Alarm via Email OME-WISE-7000 supports Email functions for realtime message communication. The sending action can be added to the logic edition as part of logic control to provide real-time message transmission function. OME-WISE-7000 provides CGI commands sending function. It provides integrated access to a wide variety of Web devices and Surveillance systems. Each OME-WISE-7000 controller can communicate with 8 remote OME-WISE-7000 controllers. The Advanced P2P function provided by OME-WISE-7000 is far more superior than the traditional P2P (DI-DO mapping) function, all OME-WISE-7000 controllers can freely share their status such as AIO channel value, DIO channel value, DI/DO Counter value or Internal Register value to each others, therefore, greatly enhances the flexibility and boosts accuracy to the logic rule design and makes it easy to enable the interactions between the controllers. Offer Various Options for Channel Settings OME-WISE-7000 offers various options for channel settings; for example: noise filter for DI signals, deadband setting for AI signals, linear scale setting, temperature degree in Celsius or Fahrenheit setting, power on value setting for DO channel, pulse output setting and DI/DO counter setting, etc. Seamless Integration with SCADA OME-WISE-7000 supports MODBUS TCP Protocol for users to perform realtime monitoring and control of the controllers. Through MODBUS TCP, it allows a SCADA package to seamlessly integrate with OME-WISE-7000 and enables total solutions for remote monitoring and control.